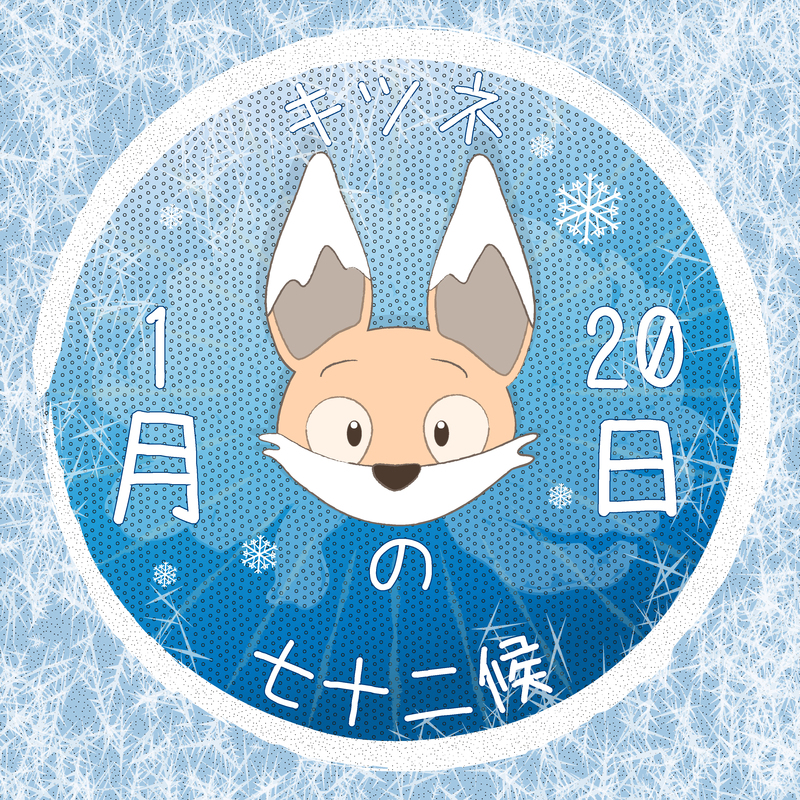 On 20th January, Kiku the fox noticed that his seasonal almanac described the ‘sekki’ beginning that day as ‘大寒’ or Daikan – meaning ‘Major Cold’. Boss Panda explained that the next two weeks were seen as the coldest part of the year, when snow was most likely in the Kanto region. “I’ve also noticed that your coat seems to have become paler during this season – perhaps you too are feeling the chill?” Indeed Kiku’s normally bright fur had become a much more subdued colour since the beginning of the year. Kiku found that the plant had traditionally been used as a cough syrup or tea (and its Latin name, Tussilago came from the words ‘to cough’ and ‘to act on’), but some health concerns had stopped its use in some countries. The leaves, which appear after the flowers have gone to seed are where the name ‘coltsfoot’ comes from. Kiku has been working on translating an old Japanese seasonal almanac given to him by Boss Panda. Originally from China, the recordings within it were changed long ago to more accurately reflect the seasonal transitions in central Honshu, the main island of Japan, where Tokyo is located. Closely linked to agriculture, the system divides the solar year into 24 segments called ‘sekki’ and each of these has a concise title that gives a general indication of the season. Each sekki is divided further into three five-day segments called ‘ko’ (climates). Each ko has an observation noted for the five days – a change in insect or plant behaviour for example, and Kiku is working his way through them, hoping that by following the little seasonal changes as remarked on in the almanac, he will come to have a better understanding of Japan, a country where seasonal foods and customs are still very familiar to many. 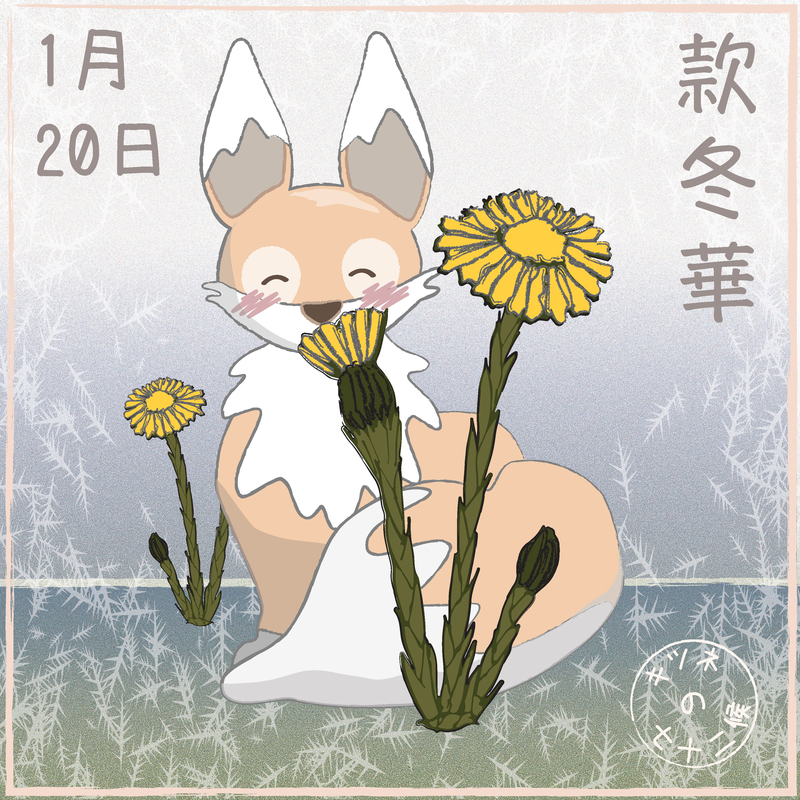 He calls his own version the ‘fox almanac’ or in Japanese the ‘Kitsune no shichijuniko’ (Fox’s 72 climates). Your illustrations always make me happy. They are so charming–both happy and subtle. The seasonal calendar continues to fascinate me. I hope one day this gets turned into a book.